Update PhotoPills now and avoid trails in your Milky Way photos! 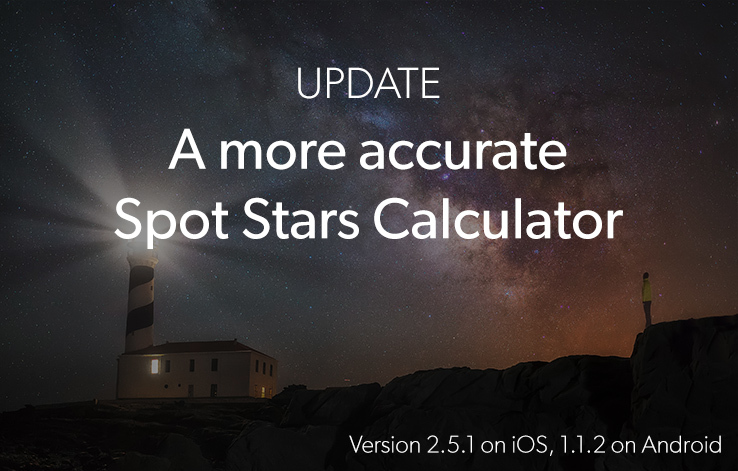 We've improved the Spot Stars calculator with the NPF rule to take into account the aperture, camera megapixels and the declination of the stars to calculate the maximum exposure time to avoid trails when photographing the Milky Way! 1- Choose your camera. The calculator will take into account the sensor size and megapixels to calculate the pixel pitch. 2- Set the focal length and aperture. 3- If you know the minimum declination of the star that is captured in your frame, set it. If you don’t know what the declination is or you’re in doubt, just set the declination of the stars to 0º. That’s the worst scenario (i.e. the celestial equator enters in your frame), so the exposure time will work for any shooting direction. You can also use the AR button (bottom) to calculate it. Point your phone where you wish to frame the shot, and the declination and the maximum exposure time will be automatically calculated. 4- Choose the accuracy. Default is the recommended value for most cases, and it will allow you to shoot longer exposure times (slower shutter speeds). This will allow you to keep the ISO relatively low. However, if you wish to print in a very large format, set this value to Accurate. You’ll get a super short exposure time (fast shutter speed). Notice that this will force you to push the ISO to get the right exposure, getting noisy images on most cameras. That’s why I suggest you to use the Default value when possible. 5- Despite the app will display both the 500 and the NPF rule results, use the exposure time (shutter speed) you get with the NPF Rule from the table of results. Use this value as a starting point, take a test shot and adjust accordingly. 6- Shoot the Milky Way with no trails! Special thanks to Frédéric Michaud and La Societé Astronòmique du Havre for developing the NPF rule. And to Aaron Priest for helping us with the implementation. We'll update the User Guide very soon too. This update also includes the following new cameras: Sony Alpha a3000; Nikon Coolpix P520; Olympus Stylus SP-100, Stylus SP-100EE. Update PhotoPills Now and Start Planning Sun, Moon and Milky Way Alignments Like a Pro! Update PhotoPills now! 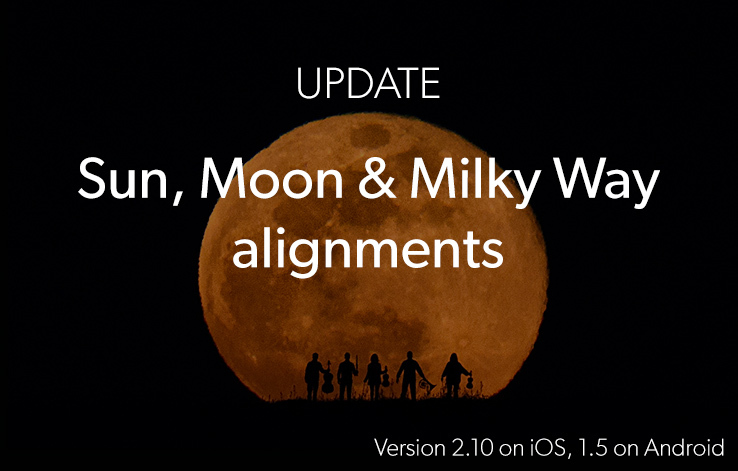 This update contains lots of improvements to make planning any Sun, Moon and Milky Way alignment above the terrain (or a building) super easy… And many more cool things! 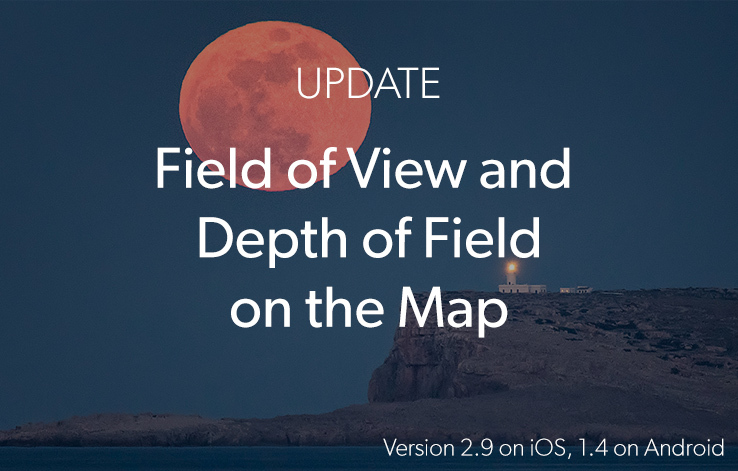 Update PhotoPills Now and Start Planning your Field of View and Depth of Field on the Map! Update PhotoPills now, go to the Planner, choose to see the Field of View or Depth of Field on the map and start planning your photo ideas till the last detail… Imagine. Plan. Shoot! 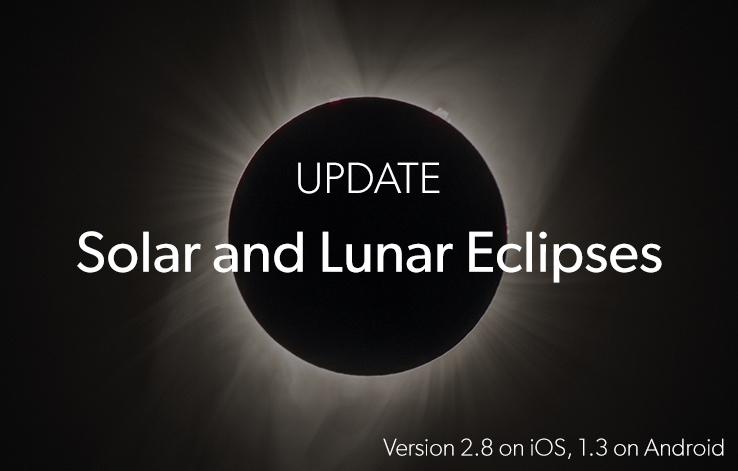 Update PhotoPills Now and Start Planning your Sun and Moon Eclipse Photo ideas! Update PhotoPills now, go to the Planner, choose the Sun or Moon eclipse you wish to plan and let your imagination fly… Imagine. Plan. Shoot. !